How often do truly great video games based on movies come around? Of course it does happen, but there is such a stigma surrounding extremely lucrative licences nowadays that is difficult to shake purely because of the sheer amount of drivel poured forth from publishers that were too eager for that quick cash-in opportunity over the years. Putting undue pressure on developers to create products in the swiftest turnaround time possible is neither beneficial to the thought process, nor conducive to the quality assurance side. The resultant output is one that has so far seen the balance of shockingly poor to surprisingly decent completely weighed down in favour of the sub-par category. Midway dealt with the 2006 release based on the first Happy Feet movie, launching across the globe with reviews generally around the 50% baseline. Warner Bros Interactive Entertainment has seized control of the brand now that Midway has since become defunct, but the question remains as to whether or not lessons have been learned for this iteration, which links in with the holiday launch of Happy Feet Two at cinemas worldwide. 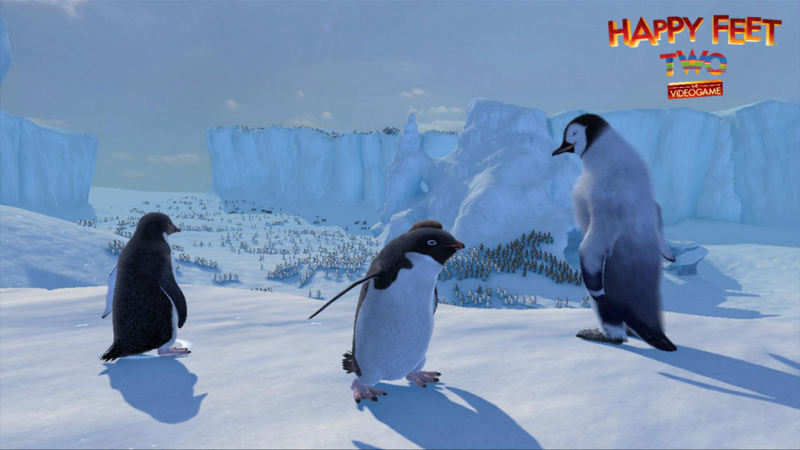 Sydney-based KMM Games has been brought on-board for Happy Feet Two: The Video Game, replacing A2M this time round, and the difference is immediately noticeable. Gone are the shoddy DanceDanceRevolution-esque and waggle-a-thon mechanics, and in come a healthy selection of levels, full of variety, with even a touch of exploration of the Metroid and Castlevania ilk, as well as Pikmin-like management of penguins, and a sprinkling of Mario vs. Donkey Kongs "reach the goal whilst avoiding obstacles" approach stirred into the melting pot for good measure. cannot dance! Do you see what they did there? Quite the twist on the original tale! Rather than facing up to the humiliation of stumbling in front of the others, though, clumsy little Erik scarpers, at which point the adventure commences as Mumble goes on an initial rescue mission, with his comrade Ramon in tow. As mentioned before, there is definitely a mix of genre types, with snippets from other high calibre releases lifted and homage paid to them in abundance. Happy Feet Two can be played with a friend, with companions put in control of tiny Ramon. Failing that, however, the more recluse of the gaming community can switch between the two characters at any time with the greatest of ease, simply pressing the L1 button, which proves vital when solving conundrums during stages, flipping separate switches, finding other penguins in areas accessible by only one penguin at a time, and so on. Anyone that enjoyed the antics of Mario & Luigis RPG antics, or even classics such as Lost Vikings, will be all-too familiar with this engaging dual character usage focus. The actual objective of each level is merely to reach the goal with as many penguins by your side as is feasible. Before diving into a new arctic locale, the camera sweeps athwart the terrain to reveal the ultimate end point, and then off you go, moving Mumble along in a third-person viewpoint at a gentile pace, trundling and jiggling around to the beat of the music track playing in the background, collecting musical notes. It all sounds rather primitive, yet levels are intricately formulated so as to leave dead ends in certain locations, forcing players to wander around attempting to "power up" by recruiting more penguins, flicking switches to open up new routes, sliding across slopes and dodging dangerous hungry birds, splitting Mumble and Ramon up to head off in differing directions, figuring out how to break down seemingly impenetrable rock formations, recruiting the help of Emperor penguins, all the while checking Mumbles health does not deplete too much after striking sharp stalagmites (replenishing hearts can be done at a painstakingly slow pace by dancing on the spot, thankfully). 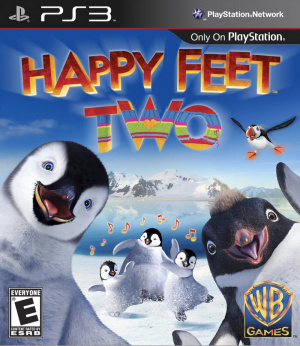 Happy Feet Two: The Video Game is surprisingly deep, certainly carrying more weight than the please the masses movie it is based upon anyway. Having a team made up of people involved with the actual movie has clearly benefitted the development process, with a true understanding of the core themes of the theatrical showcase being apparent. Having a rhythmic premise, it is no surprise to find a whole host of toe-tapping music included and other than the notes to collect, music is an integral part of the whole experience in general. The track in the background of a level starts off with only one or two instruments being played, yet the song gradually builds up as more notes are collected whilst en-route to the finish line. Collecting enough notes will help to "level-up" a song, but to reach its maximum capacity is not always possible in one stage alone, meaning the same track has to be used more than once. The benefit of doing so is to garner a few extra penguins for your efforts to help out further into the refreshingly striking journey. The more notes collected also mean that other songs can be unlocked between stages for added variety, with some exceedingly funky melodies imparted by three-time Grammy Award winning band Ozomatli. The Los Angeles-based crew throw together all manner of musical pastiches, with samba, salsa and hip-hop beats all mixed by Grammy-nominated mixer, Robert Carranza, who expertly stripped the songs to their bare bones, layering them perfectly for the structure of Happy Feet Two: The Video Games emphasis on the soundtrack upping the atmosphere. Keeping on the subject of musical influences, there are some dance challenges to break the flow, where standing by large birds and hitting R2 to instigate an en masse stomp leads directly into a brief session of tapping the corresponding face button on the DualShock 3 pad as the bouncing ball hits the on-screen trigger. The same mini-game is brought into play elsewhere, such as during key junctures of the story, with stylised comic storyboards being used for the preliminary narrative before a brief respite for the battle dance-off, with the game alternating between characters talking and the dancing section for a little longer than is necessary, sapping the fun factor from what was a moderately appealing digression. 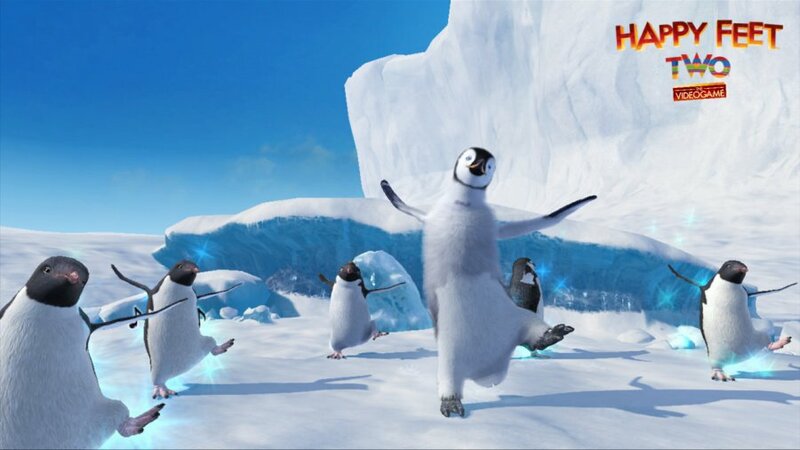 In fact, this segues almost seamlessly into why Happy Feet Two does not quite hit the highest of high notes; its pace is fairly quirky, with Mumble meandering a little slower than the ideal, the lack of penalties for taking a languid approach to level completion in general being unsatisfactory, and the overly lengthy dance sections and ice slide racing jaunts (also lacking in Move functionality  a missed opportunity) dragging to the point of tedium. A touch more zest to match the lively soundtrack would have been preferred; even adding challenging enemies to keep players on the edge of their seats as they try to wake penguins from their deep slumber, uncover golden snowflakes that cause notes to rain down from above, and pick up Disco Fish that offer up maximum power to smash anything in your surroundings would have been superb. However, the positives far out-weigh the drawbacks, and although older gamers may find Happy Feet Two: The Video Game a total breeze, it is well-suited to the younger audience it is undoubtedly aimed at. Saying that, though, there are more than fifty levels included, spread over eight chapters based on key scenes from the movie, and each new stage does employ increasingly complex designs to keep players scratching their heads trying to fathom how best to achieve the main objective. Use the co-operative slam to launch platforms skyward, enlist Emperor penguins to destroy rock formations, spin around ice poles to launch across gaps, push large chunks of ice around to create new paths  or a combination of all those ideas? 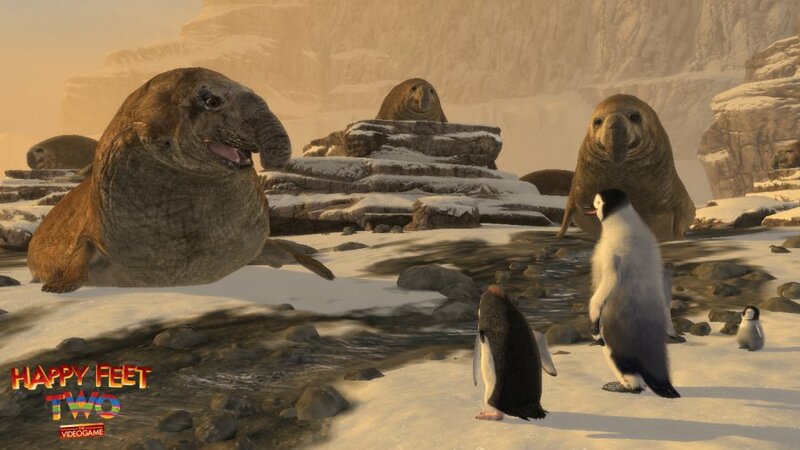 This is what makes Happy Feet Two such a pleasant gaming excursion for all ages and what will hopefully help improve the reputation of movie tie-ins in the future.